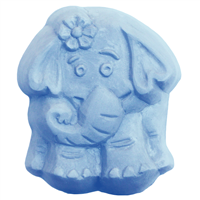 Use the Henna Elephant Soap Mold to create detailed soaps or lotion bars for elephant enthusiasts. 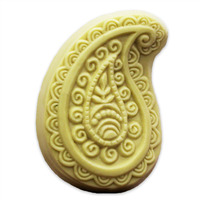 This design includes and elephant head with a beautiful henna pattern filling its face. Melt & Pour Soap. Cold Process Soap. Lotion Bars. Milky Way Soap Molds can tolerate temperatures of 135ºF to145ºF. Above these temperatures, warping may occur. Soap is easiest to release 12-24 hours after cooling. Wash molds in warm, sudsy water. Please avoid the dishwasher because that can warp your molds or make them brittle. Bar Depth: 1.25" Bar Length: 3.625"
This product does need to be listed on the product ingredient label. Melt & Pour Soap: Pour melted soap at a temperature no hotter than 135ºF into mold. Cool until soap has hardened. Remove soap from mold. For easier unmolding, place into freezer for 30 minutes, and then immerse bottom of the mold in hot water for a few moments. Do not use cooking spray to coat mold. Cold Process Soap: Coat the mold with cooking spray. Pour soap at trace into mold. After 24 hours, flip mold over onto a clean surface. Gently push the back of the mold until the soap begins to release then pull the soap out of the mold with a gloved hand. Allow soap to cure for 4-8 weeks. Note that some CP soap recipes may require a week to harden enough to remove from the mold. If this is the case with your recipe, we recommend adding sodium lactate to your recipe to assist with creating a harder bar faster. 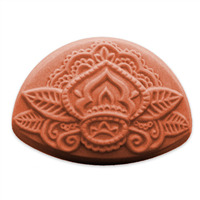 Lotion Bars: Pour melted lotion bar mixture into mold cavities at a temperature no hotter than 135ºF. Allow mixture to solidify. Flip mold over onto clean surface. Gently push back of mold until lotion bar begins to release then pull bar out of mold. Wash in warm, sudsy water. Please avoid the dishwasher because that can warp your molds or make them brittle. COMMENTS: Love this mold! Released well,and the details were beautiful! "How many ounces is each cavity?" Staff Answer We just received these molds yesterday and will get this information on the site ASAP. Thank you for your patience!